In a universe such as improvised music where, particularly in an ensemble, chance plays some kind of role, Agustí Fernández and Barry Guy did not by chance name this opus Some Other Place, paradoxical as it may seem at first sight. Much rather, it is a deliberate plight to give to this composition a title that brings up the notion of otherness, which is markedly present in both their careers. Many areas were scoured, at times under the command of one another or as third parties may dictate, and if all these worlds did have something in common then it would be this sense of quest, of adventure, of exploration of frontiers of musical forms, of eagerness to tauten a composition so as to distort it and, by extension, to transform it, to reach a threshold so remote from the starting point and yet implied from the outset. Never before did Agustí Fernández and Barry Guy choose to throw away the safety net as they do here, opening a sincere dialogue that subsumes so many years of shared musical experiments, leading a reflection on a form of art that — due to its ephemeral nature — is unrepeatable. En un mundo como el de la música improvisada, donde, sobre todo en situaciones de conjunto, una suerte de azar desempeña un cierto papel, no obedece en absoluto a la casualidad, por paradójico que resulte a primera vista, que Agustí Fernández y Barry Guy hayan optado por bautizar este trabajo Some Other Place, pero más deliberado se antoja que hayan decidido apostar para el título por la composición que recoge una noción, la de alteridad, presente en la carrera de ambos. Muchos son los terrenos que han recorrido uno a las órdenes del otro o al dictado de terceros, y si algo comparten todos esos mundos es precisamente ese componente de búsqueda, de aventura, de exploración de las fronteras de las formas musicales, de afán por tensar una composición hasta deformarla y, por extensión, transformarla, de encontrar ese lugar distinto al punto de partida pero que ya estaba contenido en él. Nunca hasta ahora se habían decidido Agustí Fernández y Barry Guy a dar un salto sin red como este, un diálogo sincero que resume tantos y tantos años de música compartida, una reflexión sobre un arte que, precisamente por su carácter efímero, es irrepetible. From the first notes, seasoned listeners of the music of Barry Guy and Agusti Fernández will understand that Sun Ra-esque title indicates territories not necessary associated with European Free Improvisation, even if both men have amply demonstrated their capacity to explore a word of nuances and evoke both the spirit of jazz past and the vitality of traditional musics from the world. This series of duets are not necessarily free improvisations; but use a mixture of precomposed material and open form, a technique that Barry Guy pioneered in his groundbreaking orchestra works. This allows the pieces to go back to fixed materials and specific passages, giving the music a special sharpness, a directness that does not deter from the freedom the musicians allowed to themselves. Guy and Fernández have been collaborating in different ensembles for about ten years now, and their musical conception is well-matched. The bassist is known for his mastery of the whole range of his instrument, from which he elicits unprecedented sounds, bringing it up to the violin range or phrasing like a guitar player, even if in this particular CD I have the impression that he plays less bow than usual. The pianist seamlessly integrates extended techniques in his playing, and can stimulate the strings via keyboard to produce classically styled, smooth sounds or attack them into percussive frenzy. This is one of those recordings that draws listeners close and keeps their attention focused. Their exchanges are so quick and so rich that, at slightly less than hour, the CD has the perfect duration of a concert set, and none of the pieces overstays its welcome, the longest being “Dark Energy” at less then nine minutes. Guy and Fernández bask into the sound and resonances of their instruments, and let the listener join in, be it the slightly Monkian distillation of “How To Go Into A Room If You're Already In” or the telluric vibrations of “Rosette” and “Crab Nebula”: attention to detail does not necessarily mean excessive caution, and several tracks feature all-out explorations, making the contrast with the more restrained pieces more effective. 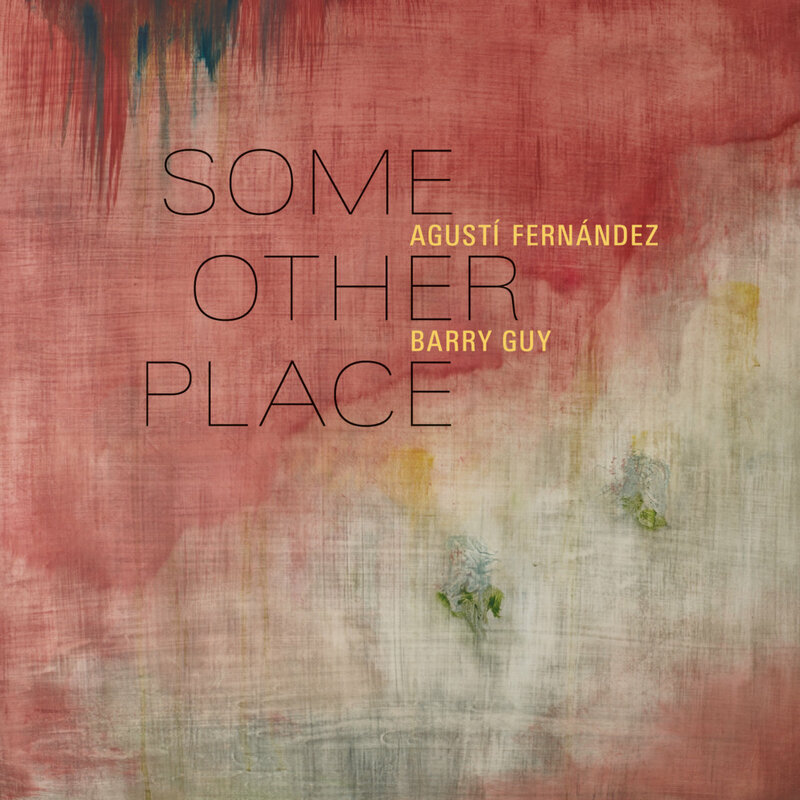 Pianist Agusti Fernandez and bassist Barry Guy are two great solo improvising musicians that have a rare talent to cooperate in music making, combining their talents for an ever greater sound. So the question is, why haven't they recorded a duet until now? Spaniard Fernandez is an original voice, perhaps best described as the love child of the disparate styles of Cecil Taylor and Keith Jarrett. That said, he can shred (if that is possible) the piano and alternately produce wrenching passages that force an emotional pause. His collaborations in duo have been, perhaps his finest moments. Highlights include Critical Mass (PSI Records, 2005), with saxophonist Mats Gustafsson and A Silent Dance (Incus Records, 2009), with guitarist Derek Bailey. He has also recorded duos with saxophonist Evan Parker, pianist Marilyn Crispell, and bassists William Parker and Peter Kowald. While Guy is well known for his large ensemble work as organizer of the London Jazz Composers' Orchestra and the Barry Guy Orchestra, he excels in the solo setting and in small group settings. Like Fernandez, his duos deserve special attention. Exceptional music has also been recorded with Gustafsson on Frogging (Maya, 1997), and with Parker on Obliquities (Maya, 1994). The two have previously released Aurora (Maya, 2006), with Ramon Lopez, and Topos (Maya, 2007) with Parker and drummer Paul Lytton, and Fernandez played on the Barry Guy New Orchestra session, Oort-Entropy (Intakt, 2005). This duo disc opens with confident, reverberating notes from both players, feeling like flat stones tossed onto a pond—each skipping, all the while making tiny reverberations on the water. The pair then delves into a little swing before hammering squared notes into disjointed round boxes. The contrasting stillness, broken by the aural ferocity is often repeated, as the pair draws from an ugly beauty and beautiful ugliness to great effect. When they break from their struggles, their liaison produces elegance. Guy's "Blueshift (for M.H.)" presents an atmospheric ballad of ineffable beauty; the lingering notes are prayers and meditations, contrasted with the immediacy and electricity of "Boomerang Nebula" and "Rosette," with its bowed notes and piano pummeling designed to unsettle any space. The duo's use of tension and release, be it in the outward improvisation or more gentle compositions, reveal two masters of modern music. Hay músicas que le roban a uno el alma, el corazón y la vida. Músicas que le enamoran a la primera oída y no hay modo de explicar porque el corazón tiene razones que la razón no entiende. Ocurre cuando los sonidos cobran una presencia física independiente de quien los genera, entonces uno más uno no suman dos. Como en Some other place. La música de Fernández-Guy es Blanton y Ellington, Cecil Taylor y Joachim Kühn, Piero della Francesca (léanse las notas de Ferrán Esteve) y Barry Guy, que es todos los contrabajistas en uno; y Agustí Fernández, tan permeable, tan seductor… júntese a los invocados y a quienes les invocan, los mencionados Fernández y Guy, y póngase el infinito como límite. Así es Some other place. Todas las composiciones son propias: seis de Fernández, tres de Guy y una de los dos al alimón. Se habla de un disco sobrecogedor/complejo a cargo de dos que son multitud, de donde el intenso trabajo de posproducción a partir de una estética exactamente contraria a la promovida por Manfred Eicher en ECM. En último término, Some other place habla de cuando la música se vuelve transparente, “y la música transparente es la única que puede llevarte a un estado espiritual” (A. Fernández).